Fresh off his victory to secure a renegotiated trade deal with Canada and Mexico, the president will deliver a message of campaign promises kept to the American people. Trump will appear at four different campaign rallies in the first week of October. On Monday, the president will travel to Johnson, Tennessee to rally with Senate Candidate Rep. Marsha Blackburn who is running to replace the retiring Sen. Bob Corker. 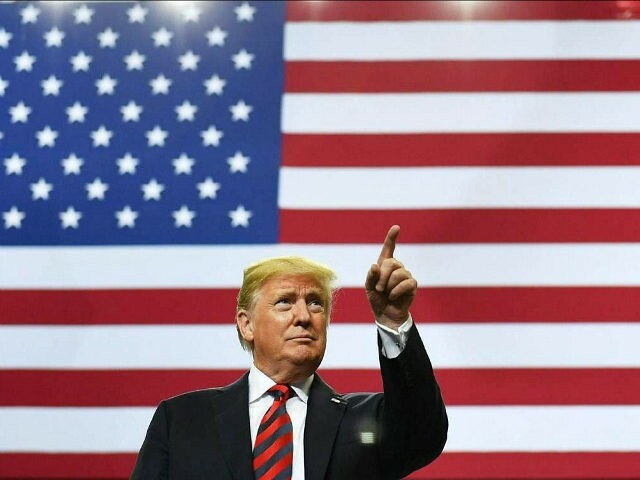 “With just 44 days from today until the midterm elections, President Trump looks forward to sharing the great news about the booming economy that’s delivered new jobs and bigger paychecks to Tennessee families,” Chief Operating Officer for Donald J. Trump for President, Inc. Michael Glassner said in a statement sent to Breitbart News. The repeatedly delayed Senate vote to confirm Judge Brett Kavanaugh to the Supreme Court has put the narrow 51 seat Senate Republican majority in focus. On Tuesday, Trump will travel to Southaven, Mississippi for a rally with Sen. Cindy Hyde-Smith. Hyde-Smith filled Sen. Thad Cochran’s seat after he retired in April, and is running for re-election. The original Mississippi rally was scheduled in September but was canceled as Hurricane Florence threatened North and South Carolina. On Thursday, Trump will travel to Rochester, MN, for a rally boosting Republican house candidates. This is Trump’s second rally in Minnesota where Republicans are optimistic that they can flip two rural Democratic House seats — in District 1 and District 8. In 2016, Trump lost the state to Hillary Clinton by only 44,000 votes. “I hate to bring this up, but we came this close to winning the state of Minnesota,” Trump told the crowd in Duluth, Minnesota during his rally in June. On Saturday, Trump plans to campaign in Topeka, Kansas, the native home of Trump’s campaign manager Brad Parscale. “This is a great opportunity for Kansans to celebrate the promises made – and kept – by President Donald Trump,” Parscale said in a statement sent to Breitbart News. The president also plans to campaign in North Dakota, South Dakota, Nevada, and Kentucky this fall as well as other states important to the Republican Party like Texas, where Sen. Ted Cruz faces a tough fight for re-election. Trump has urged Republicans to not be complacent in the upcoming elections, noting that his agenda was on the election ballot.